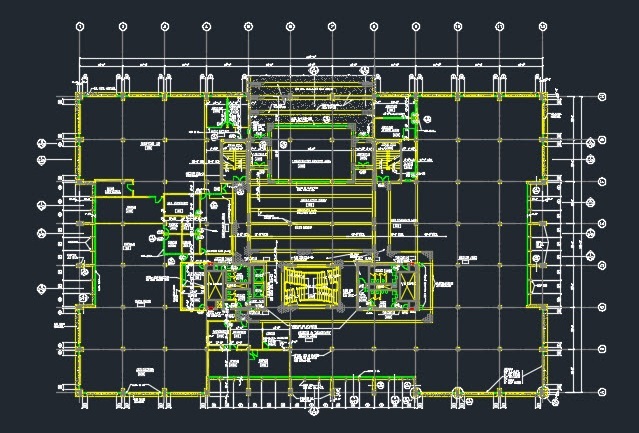 We know that layers are an important component of working with AutoCAD. We use layers to control colour, linetype, and lineweight of our objects. They control the visibility of objects and they control what is plotted and what isn’t plotted. We organize our drawings via layers. In this continuing series on AutoCAD Layers I’m taking a deep dive into not just using layers, but using all the tools at our disposal, to be as efficient as possible. I used to always say during my days of teaching AutoCAD that there is a fine line between efficiency and laziness, that we should strive to be lazy, do things as efficient as possible, so that it doesn’t take as long, we don’t have to work as hard, and we have more time for more important things like coffee! The one constant thing about layers is that they are constantly in a state of change… layer on, layer off, layer thaw, layer lock, layer color change, layer freeze, layer off, layer on, repeat, and repeat again. Its also very common to perform the same set of state changes on a group of layers. For example, turning off Plumbing, Electrical, and HVAC layers when working on the Walls of a building, and then locking the walls, turning on the Electrical to make changes to the electrical related objects. When you find yourself repeating this process of performing repetitive layer state changes to a group of layers you need to look at using Layer States. AutoCAD’s Help describes Layer States as a method to “Save, restore, and manage sets of layer settings” The process for capturing a Layer State is very straight forward…. Step#1 set the states of your layers of how you want them captured, Step#2 take the Layer State snapshot. Take for example this architectural drawing. I want to be able to quickly restore all layers to be visible, thawed, and with the correct colors as per my standard. Using the layer dialog I insure everything is set as I want. 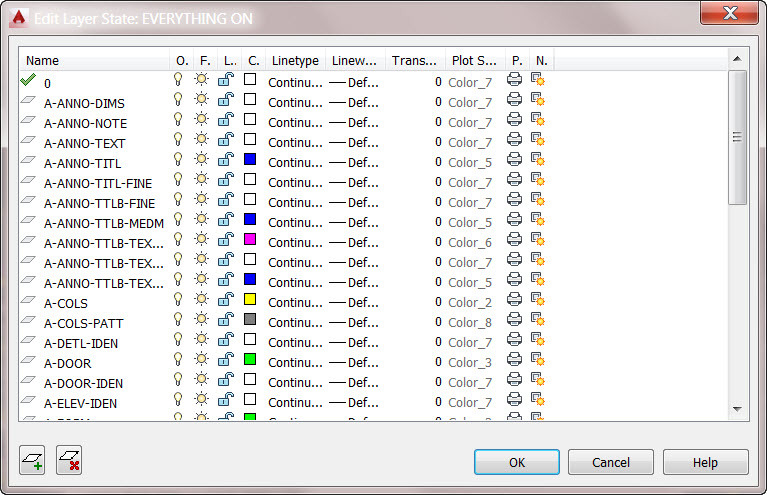 Next, using the Ribbon, I save the active status of the layers as state “EVERYTHING ON”. That’s the process! I now can quickly flip back-and-forth between the two states, quickly restoring the desired layer states. OK, now a dilemma. You’ve created a state but realize after that one of the layers is the wrong color and another is frozen and should be thawed. 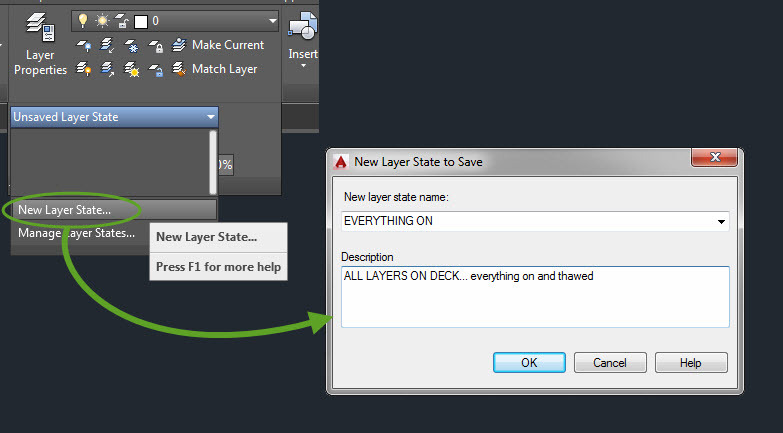 Never fear, the Layer States dialog is here to save the day! Using the Edit option you can tweak all aspects of the layers… on/off, frozen / thawed, color, linetype, locked / unlocked… you can even remove layers so that they are not controlled by the layer state. 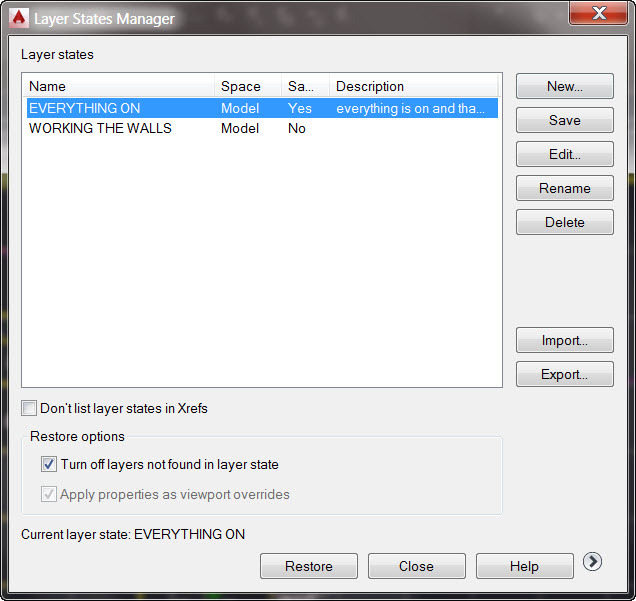 Take note of the options within the Layer States Manager. You can enable the inclusion of XREF Layers. You also set how you want new layers introduced into the drawing to behave with Layer States. 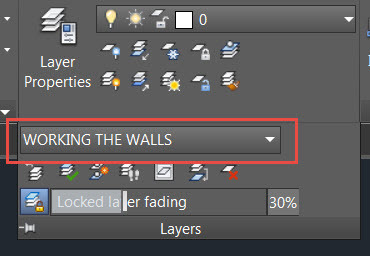 The default option is to have these new layers turned off automatically in the State. To include the layer with the state, so that the Layer State can manage it you need to edit the state and add the layer to the state. Layer States can be exported so that they can be used in other drawings. Select the Layer State in the Layer States Manager and click the Export button to export the .las file. The import button in this dialog is used to import the .las files. Albert Einstein defined insanity as doing the same thing over and over again and expecting different results. If you have groups of layers that you constantly perform the same set of state changes to why would you expect it to get easier each time? Using Layer States you can capture these frequently completed state changes into an easy to restore option. For a bit of suspense I’ve leaving out the topic of the next AutoCAD Layer Deep Dive…. will it be Layers and Paper Space Layouts? will it be Layers and scripts? will it be layers and the CAD Standards tools? The only way to find out is to tune back into the post… same bat-time, same bat-channel! As always leave us comments, we love to hear the good, the bad, and your questions and suggestions. NextiLogic Assemblies – It’s wise to normalise!